Activity Manager is a tool for setting up a Company Activity list for the work that your company performs. It also provides a way to apply cost categories and cost codes to each activity so material, labor and other project related costs can be tracked throughout the life of the project. Users with project level permissions can import the activities into each project to easily set up the Activity Log and Budget for the project. 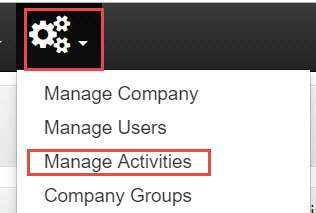 Only users with permission to manage (add, edit, delete) Company specs can make changes to the Activity Manager. Activity Manager changes are made at the company level. Project Activity Log changes are made at the project level in the Activity Log module. Changes at the company level won't change items imported to a project. Upon initial set up, the Company Activity list is empty. Items can be imported to the Company Activities from the Master CSI list. The items added to the Company Activities will improve the ease of use when setting up new projects. Company Activities are a master list of company specific items that can be imported into projects to save time standardize processes. Company Master Activities list is displayed. Note: When system is first set-up the Manage Activities list will be empty. Add Division (group) to the list. Once a group is created, sections and groups can be added to the group.